Reporting is advanced for outstanding insight into the effectiveness of our campaigns, yet simplistic enough to organize and communicate easily. Alerts and a easy to use UX. A detailed report at the end of the month enables us to report to clients on the value of their website. The software is easy to use and provides so much valuable data. The customer service is first rate. The team at WhatConverts is very responsive and go above and beyond to trouble shoot problems. The software is easy to use and provides so much valuable data. The customer service is first rate. The team at WhatConverts is very responsive and go above and beyond to trouble shoot problems. It loads quickly (I’ve used numerous lead tracking software prior to this one and almost always experienced high loading times) and it is very clean and easy to navigate. It’s quite simple to setup too! Very intuitive! I did like the navigation menu when it was along the top a little better vs. the current side menu. I don’t have a widescreen monitor, so I now need to sidescroll to see my full dashboard. It loads quickly (I’ve used numerous lead tracking software prior to this one and almost always experienced high loading times) and it is very clean and easy to navigate. It’s quite simple to setup too! Very intuitive! I did like the navigation menu when it was along the top a little better vs. the current side menu. I don’t have a widescreen monitor, so I now need to sidescroll to see my full dashboard. Easy of use, availability of critical data, ease to understand. WhatConverts has been a lifesaver for us. We were evaluating the cost of changing to a new CRM system (which would have been a headache and expensive) before stumbling across the full functionality of WhatConverts. We’re now able to track all calls and web form submissions and gain insights into the origins of the inquirer (Organic v. paid). On top of that enough cannot be said about Michael’s support. Easy of use, availability of critical data, ease to understand. WhatConverts has been a lifesaver for us. We were evaluating the cost of changing to a new CRM system (which would have been a headache and expensive) before stumbling across the full functionality of WhatConverts. We’re now able to track all calls and web form submissions and gain insights into the origins of the inquirer (Organic v. paid). On top of that enough cannot be said about Michael’s support. 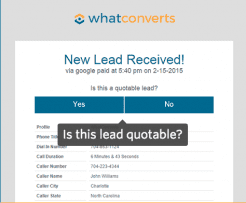 Based in Charlotte, NC, and founded just back in 2015, WhatConverts has one major focus: helping your business tracking different leads from their different sources. 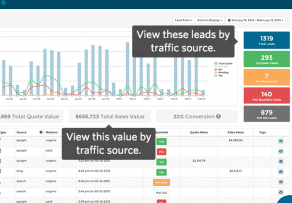 With both call and web form tracking, WhatConverts enables your business to gain new insight into the performance of different marketing campaigns with real-time reporting on leads for all sources. In fact, with a focus on lead tracking overall, WhatConverts expands beyond just call tracking, into web form tracking, keyword and campaign level tracking, e-commerce tracking, chat tracking and even event tracking. WhatConverts offers a platform to revolutionize lead management and campaign tracking to understand where your marketing dollars are working, and where things are falling short. WhatConverts also manages to offer their solutions at affordable price points, with customizable usage limits to fit your business’ unique needs. If your business is searching for a streamlined, dedicated, and complete lead tracking solution, then WhatConverts should be high on your list of considerations. With their focus only on delivering insights into lead tracking and management, WhatConverts offers the complete toolset for any business to gain deep insights into what marketing campaigns are generating leads, and which leads are the healthiest. While other solutions might include extra features like call center capabilities, WhatConverts focuses more directly on the lead tracking, leaving the calling capabilities to a solution better dedicated to that service. The benefit is that WhatConverts offers a simple platform with one major goal in mind, leading to a simple, streamlined experience for users. However, that doesn’t meant WhatConverts is missing the main features your business would need, like call recording, along with integrations with other existing platforms, and of course in-depth and real-time reporting to help your business better digest the information generated. Overall, WhatConverts offers the complete lead tracking platform, whether your business is looking to focus simply on phone calls, or expand their tracking efforts to include keywords, web form submissions, and even live chat interactions. What is truly unique about WhatConverts solutions is the way different pricing tiers, and usage limitations, are handled. Your business has three plans to choose from: the Plus Plan for the most basic users, the Agency Plan for the majority of users, as this is the most popular choice, and the Enterprise Plan for the largest businesses that need a tailored solution. However, what stands out as unique is the fact that these plans do not have a single, set in stone, usage limitation. Instead, businesses can choose the amount of phone numbers they require, and the amount of minutes required, to help better tailor the plan to fit their needs. If your business chooses more numbers, the minutes will go down, and vice versa, but this offers a unique option unseen in many competitors. At the end of the day, WhatConverts delivers a comprehensive, complete and robust solution for businesses looking to gain as much insight into their marketing campaigns as possible. WhatConverts offers tracking on levels unrivaled by other options on the market, and still manages to include the most important features. Just recognize that WhatConverts is meant to work in conjunction with a call center solution, and not necessarily as a direct replacement for call center software. What Do You Think of WhatConverts?